The Farne Island’s are one of the best places to dive in the UK. 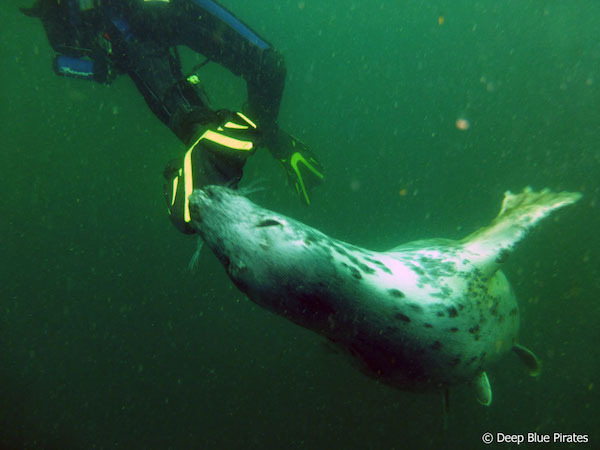 Famous for the Grey seal colony, the waters team with life on the many varied dive sites. Most of the dive sites are around the outer Farne’s with many wrecks to explore as well as stunning reefs and walls. The Farnes consist of almost 30 small islands and rock outcrops lying between 2 and 4 miles off the Northumberland coast. They are split into two main groups separated by a stretch of water known as Staple Sound. The islands are comprised primarily of a rock called whinstone, which is very prone to vertical weathering and faulting. This has produced a strange topography of steps and sheer faces above water that gives just a hint of the delights below. There is a resident colony of around 4-5 thousand grey seals on the Farne Island’s. They are clumsy on land but fast and agile underwater. The young seals are very inquisitive and often sneak up on divers to nibble fins. The best sites to dive with seals are the Hopper, Brada, Blue Caps, Big Harcar and the Knivestones. There are many wreck sites to explore, The Chris Christianson, St Andre, Abyssinia and close by the Somali and Acclivity. With depths between 15-35m there is a wreck for all abilities. Many of the walls around the islands are covered in dead men’s fingers, anenomes, soft corals and nudibranchs. The cracks in the rocks abound with squat lobsters, edible crabs, lobsters, blennies, butter fish and shrimps. 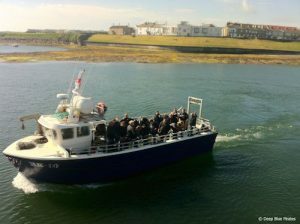 Deep Blue Pirates organize a dive trip to the Farne Island’s every month with Billy Shiel’s on one of the Glad Tiding’s fleet. This is a 2 dive trip leaving in the morning and usually returning by early afternoon. The boat leaves from the end of the main pier of Seahouses harbour, where there is ample parking and steps down to the boat. All equipment and tanks are loaded for both dives and it is best to have your drysuit on for departure as you may get wet during the crossing. Tea and coffee are available onboard but bring a snack for between dives. If you would like to join us on one of these trips check our Facebook page for the date of the next trip. We can also arrange kit hire and guided dives as well as drysuit training for those who would like to keep warm all day. Visit Billy Sheils website for more information about diving the Farne Islands. Copyright © 2019 Deep Blue Pirates Dive Centre.